When the Cardinals reacquired Ken Hill, they thought they’d found an ace. Instead, he was a dud. On April 5, 1995, in one of the first big trades made by general manager Walt Jocketty, the Cardinals got Hill from the Expos for pitchers Bryan Eversgerd and Kirk Bullinger and outfielder DaRond Stovall. The deal was considered a steal. Hill had 16 wins for the 1994 Expos, sharing the National League lead with Greg Maddux of the Braves. Hill, 29, a right-hander, joined a rotation of left-handers Danny Jackson, Allen Watson, Donovan Osborne and Tom Urbani. Hill became available because the Expos were slashing expense and general manager Kevin Malone was under orders to unload top-salaried players. The Blue Jays and Rockies also made strong bids for him. “The Jays thought they had offered a better deal for Ken Hill than the one the Expos accepted with the Cardinals,” The Sporting News reported, adding that the cash-strapped Expos were in no mood to help their Canadian counterparts. Jocketty was thrilled he didn’t have to trade to the Expos one of the Cardinals’ top three pitching prospects: Alan Benes, Brian Barber or John Frascatore. Hill was a prospect in the Tigers’ minor-league system when the Cardinals acquired him and first baseman Mike Laga from Detroit for catcher Mike Heath on Aug. 10, 1986. After the 1991 season, Cardinals general manager Dal Maxvill sought to acquire Expos first baseman Andres Galarraga. The Expos wanted pitcher Rheal Cormier, a Canadian, in return, but Maxvill instead offered Hill and the Expos accepted. Plagued by injuries, Galarraga was limited to 95 games and hit .243 with 10 home runs and 39 RBI for the 1992 Cardinals. A free agent, he departed for the Rockies after the season. Hill had 16 wins for the 1992 Expos and in three years with Montreal he was 41-21. When Jocketty brought back Hill to St. Louis, it was as if a wrong had been righted. “The Cardinals made belated amends for one of their worst trades in recent years,” Rick Hummel wrote in the Post-Dispatch. Mark Riggins, who coached Hill in the minors, was the Cardinal’ pitching coach in 1995 and Bob Gibson had been added to the coaching staff as well. 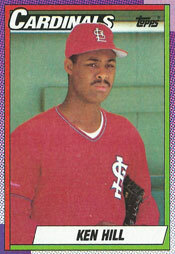 Hill won his first four decisions for the 1995 Cardinals, but lost his next four in a row. He said he wasn’t happy with Pagnozzi as his catcher and asked to be traded to a contender. With a 6-7 record and 5.06 ERA, Hill was traded again by the Cardinals on July 27, 1995, to the Indians for infielder David Bell, pitcher Rick Heiserman and catcher Pepe McNeal. “I was not happy with his performance or with his attitude,” Jocketty said. In two stints with St. Louis over five seasons, Hill was 29-39 with a 4.23 ERA. He pitched in the big leagues until 2001. In 14 years with the Cardinals, Expos, Indians, Rangers, Angels, White Sox and Rays, Hill was 117-109 with a 4.06 ERA.